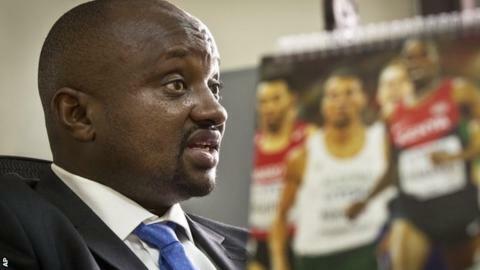 Isaac Mwangi said the corruption claims against him were "unsubstantiated"
The chief executive of Athletics Kenya wants to step down temporarily amid allegations he asked athletes for bribes to reduce doping bans. Isaac Mwangi denies wrongdoing but wants to leave his post for 21 days while world governing body the IAAF investigates the claims. The World Anti-Doping Agency said it was "most disturbed" by the claims. "The allegations have caused me a lot of mental anguish," Mwangi said in a letter to Athletics Kenya. "I am anxious to have my name cleared." Two suspended athletes claimed Mwangi had asked for money in exchange for more lenient punishments - allegations Mwangi said were "unsubstantiated". BBC Sport revealed last week that Kenya had missed a deadline to prove to Wada it was tackling cheating in athletics, following a string of positive drugs tests and corruption allegations. Archive: BBC sports editor Dan Roan is told by unnamed athletes that doping is commonplace in Kenya. It will be placed on a 'watch-list' of nations at risk of breaching the agency's code, and could then be declared non-compliant and ultimately banned from international competition - as has happened with Russia's athletes. The East African country, whose athletes are dominant in distance running, topped the medal table at the 2015 World Championships in Beijing with seven gold medals. But since 2011, more than 40 of its athletes have failed drugs tests. Three other senior officials at Athletics Kenya were suspended last year by the IAAF while an investigation took place into allegations of "subversion" of the anti-doping process in Kenya and "improper diversion" of funds received from Nike. Vice-president David Okeyo, a council member for the IAAF, president Isaiah Kiplagat, and Joseph Kinyua, a former treasurer of the national association, all deny any wrongdoing.